d3’s timeline is now frame accurate, working in hours, minutes, seconds and frames. 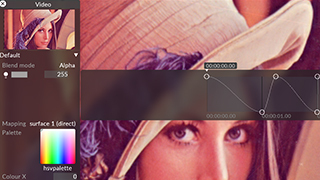 Zoom into a single-frame view to make precise adjustments as naturally as show-wide edits. The new timeline is fully compatible with existing d3 projects – use HMSF when you need precision, beats and bars for snappy rhythmic edits, or freely combine the two as the situation demands. We’ve given d3 a lick of paint. Windows are translucent with a blurred background to let you see the content beneath while maintaining legibility. The text has been updated to a cleaner, modern typeface and sharpened for retina displays. Rounded corners create a softer feel, unnecessary detail has been removed, and UI colours are more subdued to reduce visual distraction. There are also two new Timecode Transport types: System Time, and Timecode Tester. System Time makes use of the Windows clock and lets you sequence a show to the time of day, perfect for daily running installs. 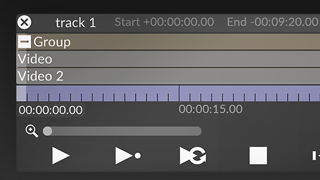 The Timecode Tester is like a built-in timecode generator and is great for testing project cueing behaviour before getting to the full-size equipment onsite. Snapping guides and rulers make a return in r13, making it easier for those setting up pixel-perfect outputs in the new feed editor introduced in r12.1. To aid with projecting onto spherical or hemispherical objects, there is now a spherical mapping type. This behaves in a similar fashion to the cyclical mapping type and uses equirectangular projection to map video content. Additionally, d3 now supports output to Puffersphere’s spherical screens.The web module has been upgraded to the latest version Chromium for the best possible performance and compatibility. Other smaller improvements include: a new multiply alpha blend mode, stage automation improvements, improved matrix control, performance improvements for sparsely populated DMX screens, auto-populate in sock puppet, as well as updates to resolution switching for VFC machines on failover.